Hello here with another MIM entry. I made my card with Natural Beauties (what a gorgeous set) and FF #11. The sentiment is from Beautiful Blessings. I also used the Woodgrain impression plate after stamping. I'm hand delivering this with a gift so I decided to make a little pocket. 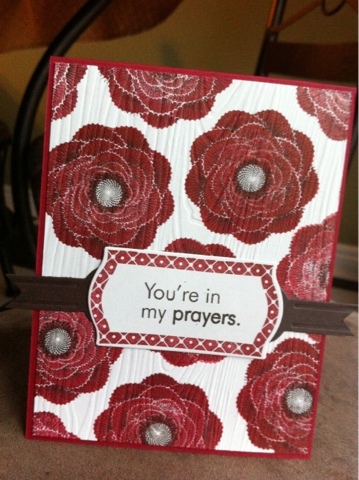 I have these Kraft square petal fold cards from Paper Source. It's meant to close all the way but I kept the top tap open. I closed it with an adhesive label that coordinates with the card. I added a little eyelet to the top. Now I can glue the pocket to a gift or hang it from a bag. OMG!!! Rose--I thought I was following your blog, and I see that I have missed every single post. So sorry--wow have you been busy creating with all these wonderful supplies. Some of them may have even passed through my hands! I am loving this natural beauties card and envelope pouch. I have never stamped that one in red, and I don't know why. Just gorgeous. Hope you and your babies are well. Oooh, this is lovely, Rose! This card is so pretty! The envelope is perfect!